Save the dates! Join Gini Graham Scott, author of Finding Funds For Your Film or TV Project, on Thursday, December 5th for a free party from 7-9pm to introduce the Crowdfunding Film Society, http://crowdfundfilmsociety.com, and its San Francisco Chapter, found at http://www.meetup.com/CrowdfundingFilm. On the 6th, from 10-4pm, there will be a program with speakers on crowdfunding, followed by a pitch to select films to be featured in the Film Society’s showcase to be promoted nationally: http://crowdfundfilmsociety.com/category/film. Below is a brief excerpt from Finding Funds For Your Film or TV Project. Crowdfunding, also known as crowd financing, involves individuals collectively networking and pooling their resources, usually through the Internet, to help the efforts of other individuals or organizations. While it has been used to fund all sorts of activities, from the creative work of artists and musicians to community programs and software development, it has become an especially popular means of funding films. For example, out of the nearly 6,500 individuals and organizations who met their funding goals as of November 5, 2012, about 10% of these were for films, or about 650 films. Until recently, crowdfunding strictly required those seeking funds this way to clearly indicate that any funds received were to be considered contributions in return for rewards or voluntary donations to support the cause and perhaps receive recognition as a result. But on April 5, 2012, President Obama signed into legislation the JOBS Act, which permits equity crowdfunding, in which a company can sell small amounts of equity to a large number of investors. The SEC has been charged with setting forth specific rules and guidelines specifying what kind of investments are possible. One rule that has already been advanced is that crowdfunding offerings will count toward the higher limit of investors permitted without having to register the offering with the SEC, permitting companies to raise money from publicity and other media such as the Internet. Moreover, crowdfunding offerings will count toward the higher registration threshold that permits up to 2,000 or more accredited investors, or up to 500 unaccredited investors, without registering. This new equity crowdfunding approach is quite different from the contribution model of crowdfunding used so far, in that a company seeking money through equity financing can sell up to $1 million in securities in any 12-month period to an unlimited number of investors, rather than seeking contributions that involve no company ownership. Moreover, companies using the crowdfunding exemption must make this offering through an intermediary that is registered as a broker (who can promote securities and solicit investors) or a “funding portal” (who cannot) with the SEC. And in contrast to making donations in traditional crowdfunding, these contributors will be investors getting shares in return for their funding. Generally, the advantage of the crowdfunding approach is that it reduces the risk of starting a company or seeking money for a film. It also helps to filter out the bad ideas, because they won’t find investors – although another big reason for not reaching your goal could be that people don’t know about your offering because you didn’t sufficiently promote it. Finding Funds for Your Film or TV Project includes a complete overview of the many different ways to get funds for your film – from preparing the materials you need, such as business plans, private placement memorandums, trailers, sizzle reels, and crowd-funding pitches – to how to make effective presentations to prospective funders, from as family members, friends, and business associates, to angels, private investors, established producers, and film financiers. Scott provides a comprehensive introduction to the many options for fund-raising, and includes information on how to prepare the materials necessary, from business plans and Private Place Memorandums to video and PowerPoint presentations to using crowd-funding techniques. The following is an excerpt from the whitepaper GETTING YOUR FIRST FEATURE SOLD by Gini Graham Scott (author of Finding Funds for Your Film or TV Project), which you can download for free here. All this and more covered in GETTING YOUR FIRST FEATURE SOLD by Gini Graham Scott free whitepaper available at halleonardbooks.com. Guest Blogger: Gini Graham Scott, author of The Complete Guide to Writing, Producing, and Directing a Low-Budget Short Film as well as the upcoming Finding Funds for Your Films or TV Project, talks about investing in films for Ray O Light Media. Are films a good investment opportunity. I think they are for the right kind of investor. Here’s why. I have written this in a Q&A style to answer the major questions that prospective investors ask about whether to invest or not. 1. Why is film investment an attractive investment opportunity? Is it because of the high return or because of the nature of business? For many investors, the high return is a big draw, because films do have the potential for a very large return, though there is a very high risk with a lot of big “Ifs”. A film can do extremely well if it has a good script, good acting, good production value, has a budget that fits the type of film this is, and strikes a chord with distributors or buyers for the TV, DVD, foreign rights, or other markets. Then, if the film goes into theatrical release, it has the potential to have an even larger audience, though theatrical is not the primary source of income for most films, just the big blockbusters, since the theater owners take about 75% of the box office unless a film goes into a long-term release and there is a high costs for prints (though an increasing number of theaters are going digital). The value of a theatrical release is more for its promotional value for gaining other kinds of sales, except for the huge blockbusters. Despite the potential for high returns for some films, investors in it for the money have to realize that any film investment is a big risk, because many problems can develop from when a film goes into production to when it is finally released and distributed. Theses risks include the film not being completed because it goes over budget and is unable to get additional financing or there are problems on the set. Another risk is that the film is not well-received by distributors and TV buyers, so it doesn’t get picked up. Or even if a film gets a distribution deal, the risk is that there is little or no money up front, so the film does not see any further returns. So yes – a film can have a high return, but an investor can lose it all. As a result, for many investors, other key reasons for investing are more important. They believe in the message of the film. They like and support the film producers, cast, and crew. They like the glamour of being involved with a film, including meeting the stars and going to film festivals. They see their investment as an opportunity to travel to distant locations for filming and for promoting the film. And they see investing in the film as a tax write-off, much like giving to a charity. 2. What kind of investment returns can investors can expect, since many independent productions are not designed for big screens, where are the sales coming from? If all the stars align, and there is a good film done with a reasonable budget and distributors, buyers, and an audience responds, the film could readily earn 4 to 10 times its cost, making everyone very happy. A low-budget indie scenario for this level of return might be a film shot for $50,000-200,000. It might get $500,000-750,000 for a TV sale and earn $1-2 million more through DVD, streaming, and foreign rights sales, even without a theatrical release. For most films, the main value of a theatrical release is the PR value of getting the film known, so buyers will want to purchase or rent the DVD and TV buyers will want to show it on one of the premium cable movie channels. Also, most films don’t get a theatrical release, and the funds are earned through other channels. 3. What kind of movies can usually generate good profits, since the recent Oscar Awards show that a big investment does not necessary mean big returns? Some of the big blockbusters that pass the $100 million threshold can certainly make a profit from a successful theatrical release, both in the U.S. and abroad. But whether they make a profit depends on their budget. Because of the high salaries of stars that are typical in these films and other high cost items, such as special effects, many blockbusters still may not make a profit. Thus, dollar for dollar, many low-budget indie films may be a better investment, since the multiples are higher with a success; there is more likelihood that a low-budget indie, which is done well at a reasonable budget, will be sold and make back it’s money, and the potential for loss is much less. Keep reading this article on the Ray O Light Media website. Some of the biggest mistakes filmmakers make have already been alluded to in previous chapters. Here I want to highlight the ones I have noticed the most. 1. Writing too much detail in the action or narrative section, or discussing what the characters are thinking or feeling. Don’t treat the script like a novel. Only describe what will go on the screen and keep these descriptions short—just enough to set the scene, since the director will set up the script based on the chosen location and the available décor and props. Only include the mini- mal descriptions of a character’s feelings to indicate how an actor might show those emotions on screen; don’t go into detail about the character’s internal processes. The nature of filming is that it involves frequent changes at all stages of the production, and you and others in various roles need to be ready to respond accordingly to successfully make your film. Normally, making these necessary changes is successful, because those making films in whatever capacity know to be flexible and responsive to changes in a project, or they won’t perform effectively or be invited to continue to participate in such shoots. For example, in writing the script, I will typically ask for feedback at script readings and make changes if this seems warranted. In doing auditions with the actors, I may make changes in the script to incorporate their lines, and if it is not possible to cast an actor for a particular role, I may make changes in the script to eliminate that role or rewrite it for another actor. In looking for crew members, I will make changes in what people will do depending on who is available; and if someone is ill or can’t come on the day of a shoot, I will make changes that day in who does what and I may take on the role of missing crew members. There may be other changes when it is difficult to get a particular item for a prop; for example the script may be changed or one prop may be substituted for another. Then, too, there can be changes when there are problems during the shoot, such as the sun moving so the lighting changes; a battery running down, so the number of scenes and takes has to be reduced; or a microphone placed in the wrong direction, so not all the sound is well-recorded, resulting in making changes in the editing process to use only the good footage that was actually shot. In short, everyone has to adapt quickly when changes are necessary during pre-production and on the day of the shoot to have a successful shoot. And normally these changes are successful, and the finished film reflect the changes that have been made during all phases of pre-production, production, and post-production. 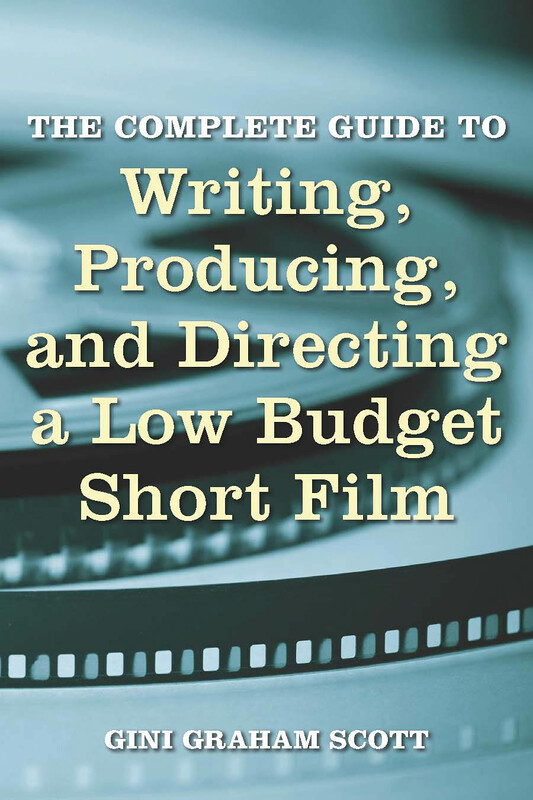 The Complete Guide to Writing, Producing, and Directing a Low-Budget Short Film is a comprehensive step-by-step overview of how to complete and promote a low-budget short film. It begins with how to write a short script, keeping in mind the goal of shooting it in one or at most two days. It discusses how to finalize your script by getting feedback and then preparing it for production through doing a scene breakdown and possibly a storyboard. It describes how to direct the film yourself or work with a director, audition the actors and cast the short, plan for and participate in the shoot, and work with an editor to finish your film. Finally, it discusses how to get your film shown, including entering it in festivals, and concludes with an extensive list of resources and references, including books, articles, script and storyboard software, conferences, expos, festivals, and more. Available for purchase from Limelight Editions or booksellers nationwide. A key aspect of the hands-on detailed planning essential for a successful shoot is engaging in extensive communication. Commonly, such communication is by e-mail with everyone once they become part of the team, as well as initial phone calls to invite actors and crew members to join the team. Then, make occasional follow-up calls to make sure people are still on board. I use the emails to let people know about the script, scene breakdowns, cast and crew credits, provide directions to the location, and let them know what time to show up, among other details of the production that come up in the week or two before the shoot. Then, by choice, since I am not the director and don’t handle the equipment, apart from providing a boom mike and boom when needed, I turn the day of the shoot over to the director, who is normally the DP, who operates the camera. This turnover of leadership empowers the director/DP to take charge, and normally the director guides the actors, though I am on the set to make suggestions about writing, locations, and the way the actors are performing in the film. After the filming is completed, I again take on this hands-on, detailed-oriented approach in working with the editor. After I give the editor general guidelines on what to do, including providing the editor with the shooting script (since scenes are commonly shot out of order) and the script in sequence , I review the rough cut, make suggestions, see another cut, and if necessary make further suggestions until the film is completed. This approach has worked very well, as indicated by the fact that many directors/DPs, as well as other crew members and actors want to work with me again, making it easier to put together future shoots. Also, this approach has resulted in getting good actors and crew members to work with as volunteers, and it has also meant that everyone who agrees to participate shows up. While many producers and directors may still prefer a more laid-back, let it happen, spontaneous style and that approach may work for many, I recommend this more hands-on detailed approach to produce a more consistent, high quality production – and commonly, cast and crew members will appreciate you for this, since you will bring more certainly and sureness to all phases of the production. Complete Guide to Writing, Producing, and Directing a Low-Budget Short Film is a comprehensive step-by-step overview of how to complete and promote a low-budget short film. It begins with how to write a short script, keeping in mind the goal of shooting it in one or at most two days. It discusses how to finalize your script by getting feedback and then preparing it for production through doing a scene breakdown and possibly a storyboard. It describes how to direct the film yourself or work with a director, audition the actors and cast the short, plan for and participate in the shoot, and work with an editor to finish your film. Finally, it discusses how to get your film shown, including entering it in festivals, and concludes with an extensive list of resources and references, including books, articles, script and storyboard software, conferences, expos, festivals, and more. Available for purchase here. Guest Blogger: Gini Graham Scott, author of Complete Guide to Writing, Producing, and Directing a Low Budget Short Film. Just about any short film takes at least several weeks of commitment if not longer to put all the pieces together, except for those very short more spontaneous shoots which some people put together in one day. But more usually, you can figure on one to three weeks for pre-production, including casting and organizing props and locations, a day for the shoot, and two to four weeks for editing. So it’s important to keep up that spirit of personal commitment for yourself and convey that to others to keep excitement high about making and completing – and later on promoting – the film. This kind of commitment will also help to keep you enthusiastic and motivated despite the problems and challenges you may encounter along the way, from rewrites of the script to breakdowns in equipment to cast and crew members not showing up to problems in transferring film to the editor, because it happens to come from an old camera, so you have to take it to a specialty house to get it turned into a format the editor’s computer will recognize. You need that commitment to keep going and see the film completed in spite of such glitches that seem to be in the nature of making almost any film. I can also help you keep that spirit of commitment and follow-through by reminding yourself from time to time why you are doing this. Is it just for fun, or do you hope that these short films will lead to a professional career in the film industry? For example, I am personally involved in the success of all the shoots I set up, which result in an organization that comes into its brief existence, once people agree to participate as cast or crew. Then, it continues for the day of the shoot and through e-mail and phone calls until the film is completed and posted on YouTube and other sites. I am very committed, since I am producing scripts I have written and know that it is unlikely that any of these scripts would be turned into films unless I took the lead in getting them produced myself, rather than trying to find a producer or director to be equally inspired to produce the script – especially since there is normally no money in creating shorts, aside from creating trailers that might be used to get funding to produce a full-length feature. Then, I am involved through the editing process or in offering suggestions to the DP/Director/Editor to see that my vision is realized. Another key reason I am so personally involved is that I want to produce a professional-looking product which will eventually result in clients hiring me to write and produce films for them and in my determining what actors and crew members I might like to work with in the future on these paid shoots. Similarly, think of your own reasons for doing this, which will help guide you in deciding what you want to write, produce, or direct in light of your goals for your role in the industry. Just as corporations create mission statements to guide their organizations to success and individuals create their own personal mission statements to guide them in making career and other choices in their life, so you might create a mission statement to guide you as you write, produce, or direct your own low-budget short-films. To this end, ask yourself what types of films you want to make and why. For example, when I went through this exercise, I determined that my mission in making low-budget short films through Changemakers Productions is to complete a high-quality film through a one-day shoot with a low-budget (typically about $100-300). Accordingly, everything I do and everything done by the cast and crew I recruit is directed towards completing this mission. For example, all the work I do to prepare for the shoot is designed to result in a successfully completed short film — which is the mission of the organization, and the actors and crew members I recruit to participate are similarly committed and willing to work as volunteers, because they can use these films for their own portfolios to get other work; and they also enjoy participating in these one-day shoots. – What types of films are you making? – Why are you making such films? What is your goal or your purpose? – Who is the main audience for your work? – What else is important to you about what you are doing? – What are the main benefits of your films to others? Then, weave your answers into this single statement of your mission. As necessary, cut down your statement, so it is no longer than 15-20 words, and preferably 7-10 words – something you might put into a short tag line of up to 72 characters. Different producers and directors have different leadership styles in organizing a film shoot. It is helpful to look at your own style and notice what works or doesn’t for you. Generally, if you want to have a smooth-running, well-organized and well-cast shoot which results in a high-quality short film it is better to develop a more hands-on detailed leadership style. When you have a more leave-it-to chance, let’s just go out and shoot type of approach you have more of a risk of things going wrong, such as people not showing up or showing up late, not having the equipment you ideally want for your film on hand, and having actors who don’t know what they are doing. – working with the director/director of photography on the day of the shoot to make sure things go smoothly. In short, there are many different tasks to be performed for a successful shoot, so it is helpful to be very organized to keep the various elements of the production together from the pre-production phase, which involves doing everything before the actual shoot and during the production. Then, unless the director/DP is going to edit the film and wants to be left alone to do this, with you only providing some suggestions and feedback, it is good to continue this hands-on, detail oriented style in working with the editor, and if you do your own editing, being very detailed editor comes with the territory.